I'm very excited to announce that three of my pieces have been accepted into the Main Show at Oxide Gallery in Denton, Texas. Oxide is a great little gallery with a variety of artists. 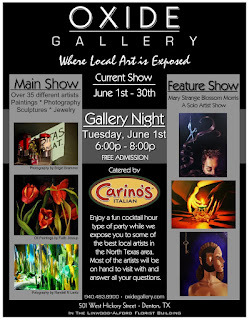 Tonight, Tuesday, June 1, 2010, is this months "Gallery Night", so I will be there to meet the other artists and art lovers. If your in the area the gallery will open 6pm to 8pm for the event. What pieces of mine are showing? Well, here they are!